"The Vanguard's intelligence sources now believe, with good confidence, that Sekrion oversees the expansion of the Vex network through the crust of Venus." Sekrion, Nexus Mind is a massive Vex Hydra that lives deep within Venus. It is the Axis Mind in charge of converting Venus into a Machine World. In The Dawning Sekrion returns as Sekrion, Subverted Mind. "Far below the Ishtar Academy, the Vex have set something in motion: a world-eating machine transforming Venus into another link in their intergalactic chain. This Nexus must be stopped and the Mind that controls it destroyed." "The mind is wielding a sufficiently upgraded chassis." "I bet bullets still work." The Vex still continue to struggle since their numerous losses to the various forces of the Solar System, namely the Guardians and the Taken. 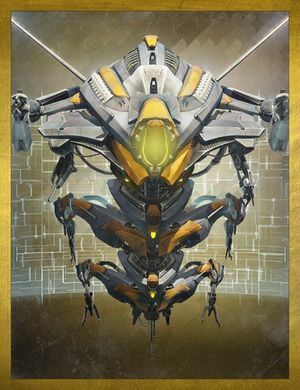 To counter the Guardians and restart the process of converting Venus into a machine world, the Vex uses its ontological technology found in the Vault of Glass to repair the Nexus Mind. Cayde-6 refers to this plan being a fearful, desperate plan for the Vex. However, Ikora Rey's Hidden intelligence discovers this plan and so organizes the Guardians to destroy it before it can complete its work, all while dealing with the remaining Taken on Venus. After being guided by Ikora and Cayde-6, the Guardians reach the restored Nexus Mind, which was corrupted by the Taken as Sekrion, Subverted Mind. Despite its restored chassis and newly upgraded abilities, the Taken Vex Mind is destroyed once again. Sekrion is the final boss of The Nexus strike. It fights like an ordinary Hydra, but fires its Aeon Maul more rapidly. It stays in the center of the arena, allowing Guardians to avoid its fire by ducking behind stone pillars. Additional Vex will spawn to flush out the players around the room, so players should be wary to not completely focus on the boss. In the Revisited version of the strike, Sekrion makes a return as the final boss. Once again, it stays in the center of the arena, pounding Guardians from afar with its Aeon Maul. It has gained a special mechanic: like the Oracles, if you get Marked by the Void then every Guardian must step in a pool of Light to remove the debuff, or else die after your screen goes completely black. Alternatively, in the Taken version of this strike has players remove Sekrion's shield by firing an Aegis at him so Guardians can defeat him. The Taken version of the Nexus Mind bares a striking resemblance to the Seditious Mind. A frontal view of Sekrion.